Website Design painting companies South Carolina | This is a custom designed Word Press web site. The site has hero banner images linking to a call-to-action form. The home page and interior pages feature iconography for the 6 primary service areas linking to interior pages. VISIONEFX provides the finest in Web Design for business and companies throughout the state of South Carolina. VISIONEFX will take your new website and Web Design South Carolina to a whole new level of excellence. 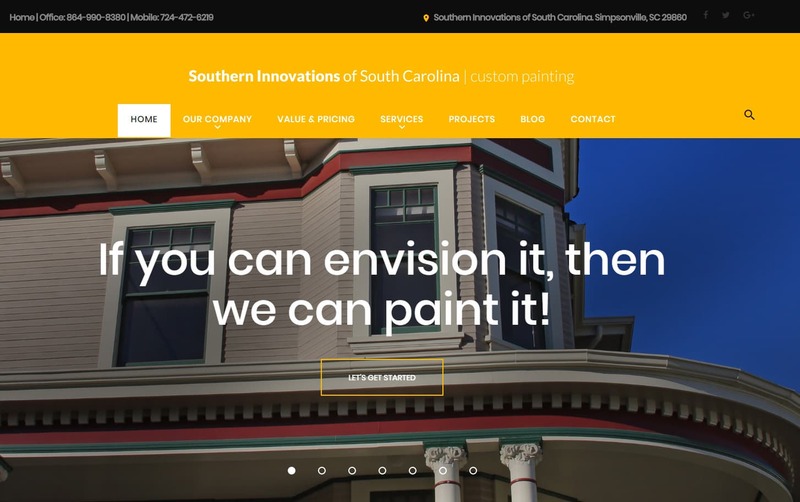 This recent web design Simpsonville SC project for Southern Innovations of South Carolina provides a competitive branded website presence in a highly competitive space. VISIONEFX, a Web design company based on the U.S. East Coast providing extraordinary web design for small and large businesses businesses throughout the United States to include; custom web design, web development, E-commerce web design, Word Press web design, Word Press plugin customization, Joomla web development, SEO Search Engine Optimization services, web maintenance services, custom database and programming for custom web applications. For more information about Web Design South Carolina or word press custom websites call (757) 619-6456 or email info@visionefx.net. or contact here.